At Weisner Orthodontics, we pride ourselves on combining high quality orthodontic care with a gold standard in customer service. Dr. Weisner and our highly trained team of orthodontic specialists work hard to treat every patient on an individual basis, designing specialized treatment plans that perfectly suit their unique orthodontic needs. While treatment alternatives like Invisalign are gaining in popularity, braces are still the most popular form of orthodontic treatment by far - but even within this one method, there are a variety of options available to you! 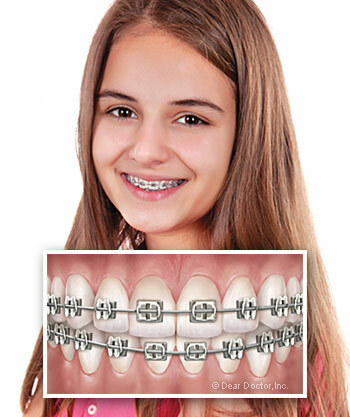 Traditional metal braces are usually composed of high grade stainless steel, and even with the rise of other options, they still remain the most popular orthodontic treatments. They're cemented to the teeth with metal bands that wrap around the back molars, while smaller metal brackets are attached to individual teeth using a special dental cement. Finally, a thin metal archwire runs along each dental arch and does most of the heavy lifting for actually moving teeth into new positions. Depending on the treatment type, we may affix this archwire with elastic bands, metal ties, or special kinds of clasps. There's good reason for braces to remain so popular. They offer a dependable, powerful, and cost-effective form of treatment that can usually take on even the toughest of cases. While they're not as slim as alternatives like Invisalign, today's braces are thinner, more attractive, and more comfortable than ever before - and we can even customize them with different colored elastics, helping you express your sense of style! Clear ceramic braces use the same fundamental techniques and principles as braces, with one key difference: the brackets are made of a translucent ceramic composite material, so they blend in with teeth. This makes them far less noticeable to observers, making them hugely popular with professional adults - even with some well-known celebrities! While the appeal is undeniable and the technology continues to improve, there are still a number of trade-offs with ceramic braces. 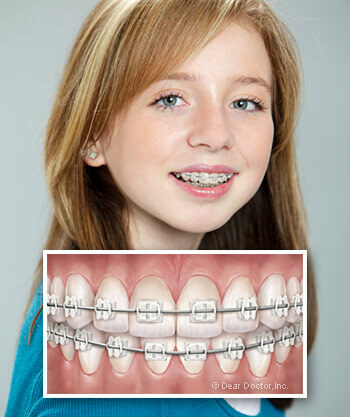 For starters, ceramic braces are less durable than metal ones, and while the brackets themselves won't stain, the clear elastics used to hold the archwire will - so braces can discolor between visits. We'll work with you to decide if ceramics are the right choice for you or if metal braces might work better with your lifestyle. Have more questions about our treatments or want to come in for a visit? We're happy to help! Feel free to reach out to us at our contact page with any questions or use our easy online form to schedule your appointment at our Methuen or North Andover, MA office. We can't wait to hear from you, and we look forward to helping you achieve a beautiful, healthy smile.